Nexis Uni (the successor to Lexis Nexis Academic) offers the full text of (many) articles from Dutch and international newspapers and newsmagazines. In addition Nexis Uni provides company information on Dutch and international businesses. What will you find in Nexis Uni? Company information about Dutch and international businesses, including financial information, annual reports and ownership structures. In addition, Nexis Uni contains mostly American legal sources and caselaw. How do you search in Nexis Uni? When you enter a search question in the large search box on the homepage you search all available content in NexisUni in one go. Under the heading Guided search choose News or search in a specific publication (A publication). Click for an overview of all sources on `menu’ on the homepage and select `all sources’. 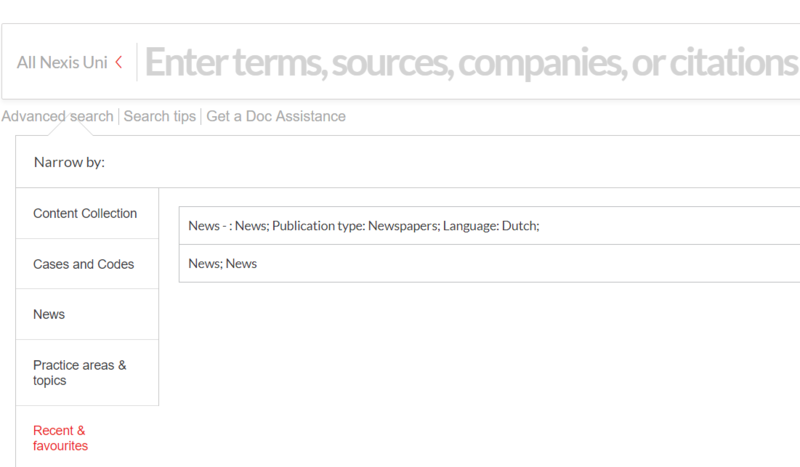 It is possible to limit your search results to Dutch papers only, for instance. 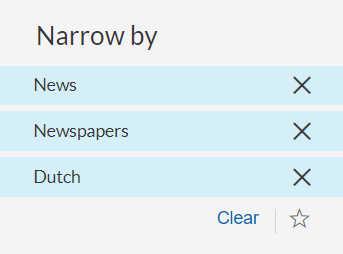 Enter a search under News under Guided search and use the filters in the left-hand column to narrow by publication type (Newspapers) and language (Dutch). If you click on the star, you keep the filters for your next search. By creating an account, you could save your filters for a next search session. How do you search in a specific newspaper or publication? In the Guided search you search (in) a specific source. How do you search for company information? You will find and extensive search interface if you click on the picture `Business’ on the homepage. From the home page, click on the Sign In | Register link in the top right corner. You will be taken to a sign-on page. Click the Create a profile now button. A self-registration form will open. Enter your First name, Last name and Email address in the form fields. Middle name is optional. Click Submit.